The remains of a Tudor Artillery Fort that was partially demolished and rebuilt into an enhanced Martello Tower in the early nineteenth century. The site is now a private residence but the exterior can be viewed from the beach. Martello Tower. The Tudor Keep was rebuilt into a Martello Tower in 1805-6. The inner and outer curtain walls were demolished at this time. Today the tower is topped with a distinctive steel cap. Notes: The castle is not sign-posted but is easy to find as it overlooks Sandgate beach. There is a (pay and display) car park nearby with direct beach access although on-road parking next to the castle is possible (although normally very busy). Sandgate Castle Plan. The perimeter of the castle extended onto the beach and beyond the high water line; hence the reason why the site was regularly damaged by the sea. Today almost everything to the south of the central Keep (now the Martello Tower) has been lost. Sandgate Castle was the first of Henry VIII’s ‘Device Forts’ and guarded a beach that stood just 25 miles from the continent making it a likely target in the event of an invasion. Whilst it saw no action during Henry’s reign, it was briefly occupied by the Royalists during the Civil War and was regularly reactivated for coastal defence purposes. In 1539 Henry VIII embarked on the largest coastal defence programme since the Roman era. His Act of Supremacy (1534) had made the King, rather than the Pope, "supreme head" of the English church prompting condemnation from both France and Spain. This was compounded by peace between those two powers potentially giving either the capacity to mount an invasion. A Device (Act) was issued commencing a fort building programme to provide defences at vulnerable points along the coast. Sandgate Castle was the first to be constructed with work starting in March 1539 and continuing until the completion of the fortification in October 1540 at the cost of £5,584. The work was overseen by Stefan von Haschenperg, a land surveyor by trade, and whose expertise in castle building was questionable; in September 1539 his assistant, Thomas Cockys, wrote to Thomas Cromwell, Lord Chancellor stating Haschenperg wished to construct the roof with canvas and tar vice lead. Sandgate was unique amongst the 1539 building programme as it was the only castle not built to defend a specific harbour. Instead it was intended to guard the vulnerable beach that ran between Folkestone and Dover which was ideal for beaching ships and less than 30 miles from the French coast. Like Henry VIII's other early castles, it was built to a concentric design. In the centre was a three storey circular Keep and this was surrounded by an inner curtain wall augmented by three circular bastions. An outer curtain wall, which encroached onto the beach and beyond the high water mark, surrounded the entire structure. The design enabled multiple tiers of guns that could be brought to bear in all directions - in total the castle had 130 gun emplacements. A gatehouse and barbican provided access from the landward side. Although the invasion fears of Henry VIII's reign passed without incident (notwithstanding a French skirmish around Sandown Castle on the Isle of Wight), Sandgate's proximity to the French coast saw the fort reactivated on numerous occasions including during the reign of Elizabeth I when it stood guard against the Armada in 1588 and also had the dubious distinction of being used to hold Thomas Keys, her Sergeant Porter who had illicitly married Lady Mary Grey. By the early seventeenth century the castle had been damaged by the sea and was left derelict for several decades before being rebuilt in the 1630s. During the Civil War the castle was garrisoned by Parliamentary forces but saw no action. However in 1648, during the Second English Civil War, the castle was seized by Royalist supporters. The war had started in Wales but, no sooner had Cromwell marched into the Principality to suppress it, a revolt in Kent started. Fuelled by frustration over the abolition of Christmas, tens of thousands of rebels flocked to the banner of Charles Goring, Earl of Norwich. With the bulk of the army in Wales, the Parliamentary commander - Sir Thomas Fairfax - only had a small force to counter him. Nevertheless he moved against the rebels and bottled them up in Colchester. The myriad of small forts occupied by the Royalists, including Sandgate, were besieged and retaken. The castle's exposed location saw further damage from the sea in the early eighteenth century prompting substantial repairs in 1715-16. 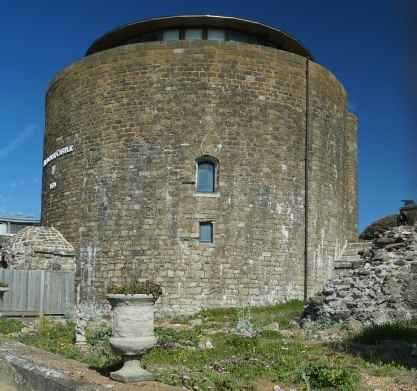 It was periodically garrisoned throughout the many wars of that century and, due to the increasingly alarming threat from Napoleon, was converted between 1805-6 into a Martello Tower. These were small circular towers housed a small garrison and a limited number of guns but, when Royal Navy ships had engaged such a structure off Cape Mortella, the design had proved resilient. Great Britain adopted the design and Martello Towers, a corruption of the name Mortella, were built along the South and East Coasts. 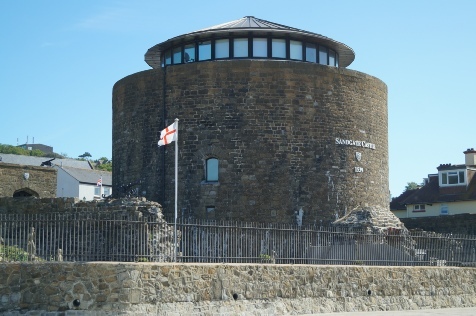 Sandgate underwent extensive modification to meet the new requirement; the Keep now became the main fortification and was rebuilt/reroofed whilst the surrounding bastions and barbican were demolished. Nelson' victory at the Battle of Trafalgar (1805) followed by the final defeat of Napoleon at Waterloo (1815) saw a protracted period of peace between England and France. 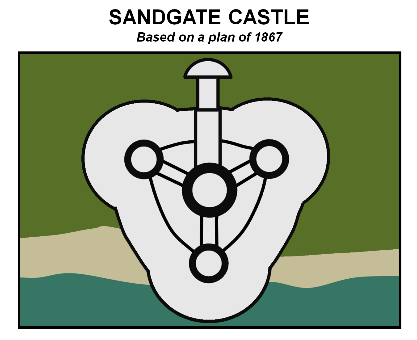 However Sandgate Castle retained a small garrison which was used to counter smuggling. The site was hastily re-activated as a substantive fortification during the invasion fears of 1859 with upgrades to the gun emplacements and construction of a magazine. Again the invasion fears soon passed and in 1898 the castle became a private dwelling. The castle survived an application by the South Eastern Railway Company to demolish to make way for a Hythe to Folkestone railway but was then undermined by the sea in 1928 destroying a significant portion of the structure. Despite its depleted state, it was still re-activated during the World Wars; of note in 1940 pillboxes were installed to counter any German landing and it was later used as a bomb shelter. Today the remains have now been (temporarily?) stabilised by construction of a sea wall.